Happy Holidays! It’s the time of year when holiday festivities come into full swing. What better way to celebrate than with fun-filled seasonal activities? In order to help you all get into the spirit of the season, we have captured a list of some of the area’s best holiday parades. Check them out below. This is year 16 of this annual parade. It features light up floats, performances, music and more. Festivities start in Downtown Allen Park. Welcome to Wyandotte! Their parade begins at Northline near the Police/Court Building. It ends at Eureka. The parade will feature local marching troupes. It also includes pipe and drum and marching bands, schools and organizations from throughout Michigan and Canada. The best part is, it ends with Santa Claus! The Macomb County Santa Parade is presented by the City of Mount Clemens. It runs on Main Street from Church Street north to Clinton Street. Continuing tradition, the parade ushers in the holiday season with the arrival of the jolly old elf himself, Santa! There are over 120 units in the parade. This includes new floats, marching bands, and characters. The sights and sounds of the season are present for all to enjoy. 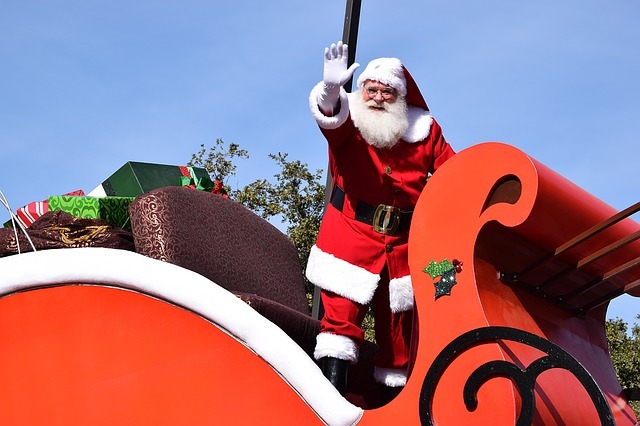 After the parade, enjoy a Meet & Greet with Santa and Mrs. Claus. Rudolph, Frosty the Snowman, and live reindeer will be there as well! You may also visit the Inflatable Christmas Village. The village has a 20-foot-tall Rudolph, Elsa, Olaf, and more. Live on or near Royal Oak? Their Holiday Magic Parade kicks off the season. Festivities start on Washington Ave at Lincoln Street and head north to Fourth Street. There will be over 80 parade units. This includes marching bands, floats, musical performances, circus acts and more. After the parade, end the day by visiting Santa. This one is a true classic! America’s Thanksgiving Parade is presented by Art Van. This is one of the country’s largest and most spectacular Parades in the United States! Every November something magical happens on Detroit’s historic Woodward Avenue. This holiday tradition dates back to 1924. This year, they are celebrating 90 Years Together full of sparkles and magic that have captured the imaginations of millions of children and their families. Every year, hundreds of thousands of Parade spectators line historic Woodward Avenue Thanksgiving morning. Visitors watch the larger than life floats, colorful helium-filled balloons, thunderous marching bands, and exciting specialty acts pass by! The Parade is televised live locally on WDIV-TV, Local 4 with a syndicated national potential reach of over 65 million households! Radio coverage provided by WJR AM 760. This year, Holly packs in two parades during its annual festival themed to the Charles Dickens era. On Friday, November 25 there will be a lighted parade. This is followed by a tree lighting ceremony and the arrival of Santa Claus. On Saturday, December 3 there is an afternoon Christmas parade featuring caroling, an abridged performance of A Christmas Carol, and Santa. Both parades step off from the Holly Elementary School Parking Lot, 801 E. Maple St., Holly, and head downtown. The 41st Annual hometown parade takes place the Friday after Thanksgiving! This year's theme is Jingle Bells. It will feature hot chocolate, holiday floats, and characters. It also includes Santa reading to kids at the end. The parade will start at Kercheval Avenue and end at Cadieux. The theme of the 56th Downtown Garden City Santaland Parade is “It’s a Gingerbread Thing.” This incorporates the City’s “It’s a Garden City Thing” campaign. The parade will begin at Garden City High School. It will feature plenty of music, floats and characters. Afterwards, meet Santa and enjoy hot chocolate and entertainment at the Garden City Town Center parking lot. Since 1989, the downtown streets of the Village of Lake Orion, Michigan have glowed with festive holiday lights the first Saturday of December. The Orion Lighted Parade has been a tradition for northern Oakland County. The parade will have more than 75 entries this year. This includes civic organizations, dance studios, scouting troops, local dignitaries, marching bands, school groups and more. Santa himself will cap off the event with a special visit. The theme of this year’s annual Hometown Christmas Parade in Rochester will be “Holiday Masquerade” this holiday season. Catch the action down Main Street in Rochester. These are just a few of the upcoming holiday parades taking place in eastern Michigan. It is our hope that if you wish, you will decide to check out at least one of these family friendly events when celebrating the holiday season this year. Just like these various parades, our campuses are located throughout the state. Interested in learning more about the Dorsey Schools?